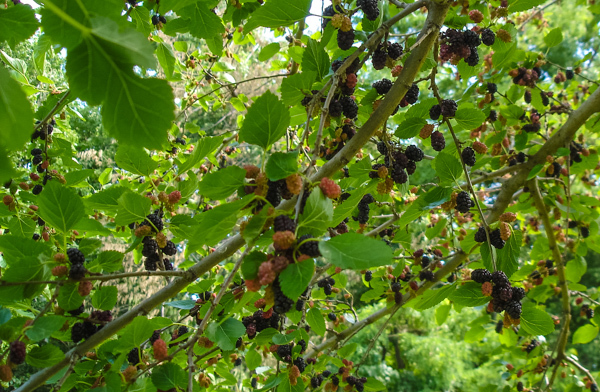 We have several Mulberry trees in our yard. A Black Mulberry and a White Mulberry. The Black Mulberry is more tart, the White Mulberry is really sweet. Did you know that if you take a green unripe Mulberry and rub it on your stained hands, the stain will disappear?! Raspberries, blackberries, and strawberries are the berries commonly used for making jams, and require an equal weight of sugar and fruit. Included on this page are other less common preserves and jam recipes. 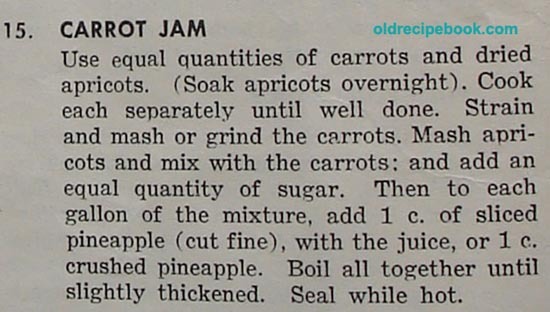 For instance, who ever thinks of making Carrot Jam? Mash a few in the bottom of a preserving kettle, using a wooden potato masher, and so continue until the fruit is used. Heat slowly to boiling-point, and add gradually an equal quantity of heated sugar. Cook slowly forty-five minutes. Put in a stone jar or tumblers. Follow the directions on a box of commercial pectin powder for Raspberry Jam, substituting mulberries. -Only at the start, add juice of 1 lemon to each recipe. -Just before taking off of stove, add 1 pkg. of raspberry Kool-Aid and boil another minute or two. Then seal. Mix 1 qt. sweetened applesauce, either fresh cooked or canned, with 1 can red raspberries, sweetened. Add 3 c. of sugar and boil gently until thick. This is the first year for our rasperries bushes, but thankfully we got a few to snack on anyway. Mash the blueberries in a pot. Start heating. While it is heating add 1 packet of Pectin and stir into the mashed blueberries. Boil jars and lids in a separate pot. Stir constantly and bring blueberries and pectin to a rolling boil (will boil over if stirred). Add 4 cups of sugar and bring back to a boil for exactly 1 minute. Again stir constantly. Remove from heat and put into previously boiled jars. Place lids and rings on jars and tighten. The lids should pop when they seal as the jars cool. This makes about 6 pint jars of jam. 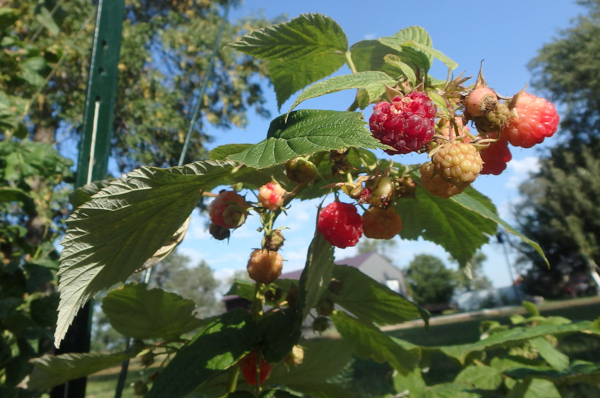 My Note: Recently, we added 3 Honey Berry bushes to the garden. Since they are similar to blueberries, I intend to use this blueberry jam recipe for the Honey Berries. Use equal quantities of carrots and dried apricots. (Soak apricots overnight). Cook each separately until well done. Strain and mash or grind carrots. Mash apricots and mix with the carrots: and add an equal quantity of sugar. Then to each gallon of mixture, add 1 c. of sliced pineapple (cut fine), with the juice, or 1 c. crushed pineapple. Boil all together until slightly thickened. Seal while hot. To each 7 cups of ground cherry pulp, add 1 pkg. of the powdered pectin. Bring to a roiling boil, stirring well. Then add 8 cups sugar and cook until it "sheets" from a spoon. The addition of 2 T. lemon juice or vinegar improves the flavor. Also see Canning Peaches for a Ground Cherry Peach Jam. Wash 1 lb. of dried apricots and soak them overnight in the juice drained from 2 #2 size cans of crushed pineapple. In the morning, chop the apricots; drain them and put through the food chopper. 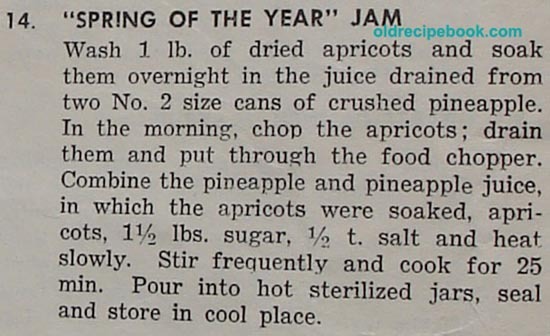 Combine the pineapple and pineapple juice, in which the apricots were soaked, apricots, 1 1/2 lbs. sugar, 1/2 t. salt and heat slowly. Stir frequently and cook for 25 min. Pour into hot sterilized jars, seal and store in cool place. Mix rhubarb and sugar. Let stand for 4 hours or overnight. Then boil rhubarb and sugar for 10 minutes, stirring often. Add blueberry pie filling. Boil 10 minutes, stirring often. Add raspberry Jello. Cool. Put in jars. Refrigerate. VARIATION: Can use different pie fillings and Jello's, if desired. Tip: Freeze rhubarb when it is in season, so you can make this all year round. Cut the rhubarb up finely and place 6 cups in a ziplock bag and freeze. Ready to use all year! 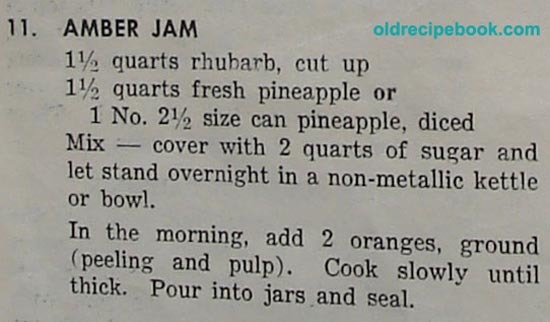 Combine rhubarb and sugar. Let stand until the sugar draws juice, about 3 to 5 hours. Boil for 10 minutes. Remove from heat and add flavored gelatin. Makes 2 pints. Cook rhubarb and sugar together for 20 minutes, stirring constantly to prevent scorching. Remove from heat and add Jello, stirring until dissolved. Pour in jars and keep in refrigerator. Cook rhubarb, water and sugar until rhubarb is soft. Remove from heat; add pie filling and the 2 pkgs. of Jello. Stir. Cool and freeze. In a large saucepan or stock pot, combine the rhubarb, sugar and pineapple. Bring to a boil over medium-high heat. Boil for 10 minutes, stirring frequently. Jars can be sterilized at the same time. After the rhubarb mixture has boiled for 10 minutes, remove from heat, and stir in strawberry flavored gelatin powder. Transfer to sterile jars, seal with lids, and process for 15 minutes in a boiling water bath. Allow jars to cool in a draft-free area. Refrigerate jars after seal has been broken. 1 1/2 qts rhubarb, cut up. 1 1/2 qts. fresh pineapple or can of chuck pineapple. --Cover with 2 quarts of sugar and let stand overnight in a bowl. In the morning, add 2 oranges, ground (peeling and pulp). Cook slowly until thick. Pour into jars and seal. Cut orange slices up fine and mix with rest of ingredients. Stir to prevent scortching, also at first, to draw out the juices. Cook 30 to 45 minutes, or until thick. Put in small jars and seal.